What a celebration! Grandma Chickie turned 100 on January 4th. She had so much fun visiting with people who came from miles around to share this day with her. Here she is holding her high school graduation picture. She honestly told the news paper that she didn't know if she could make it another 100 years. This great lady still lives on the farm and inspires me every day. My father in law is still in the Rehab Nursing Home working hard to recover from a stroke. He has been back and forth between the V.A. Hospital and the nursing home due to a few setbacks. Please keep him in your prayers because he sure has a long way to go. This week I've been setting goals for myself and my artwork for the New Year. Yesterday I finished this little Valentine Painting and will be working hard to paint more this year. Motivation has been very difficult for me this year, but I promise to get with it soon. Tiny red sprinkles glisten on the edge of this luscious butter cream frosting. This chocolate cupcake in a red wrapper is accented with white hearts. A red "cupid" heart pearced by an arrow tops it off. A red and white dotted ribbon is wrapped around the edges of the canvas and tied in a bow at the top. Hopefully lots of new and exciting paintings will fly out of my studio this year. If you have any ideas for what you'd like from my blog this year, please leave a comment. Please leave a comment anyway because I truly love reading everyone of them! 100 years ! She expereinced so múch. Unbelivable how her world changed. My granny became 93. She was born 1905and died 1999. I think she wanted to left the worls in her century. She rememberd the first world war, was a refuge with to kids in WW2 and when she told us about her childhood, about going to the public well to get water, it seems to me, that she came from another world. It is great that you have her around you, old people ( when they are nice) are like jewels. I am sorry that your father in law is still so ill. That must be burdensome for you. I can imagine, that it is not easy to be very creative under that circumstances. Never mind, paint as you feel. Your paintings are allways so sweet. And I love especially your charming village scenes and your great little shops. Wishing Grandma Chickie a very happy birthday! What an inspiration. So nice to meet you and thank you for stopping by to visit my studio and your kind comment. I have really enjoyed my visit here to your lovely blog. I have such a warm spot for the folk art style having painted in that medium for years. Now I have settled on the shabby rose styles but I still like to do a folksy creation now and then. You are very talented and I love your cupcake designs too. Cottage are a favorite of mine also and I paint many country scenes with rose inspiration. What an inspiration Grandma Chickie is. Birthday wishes to her and I also hope your FIL recovers and I will remember him in prayers for better days ahead. Wow! God bless Grandma Chickie! Sending good thoughts to your father in law. 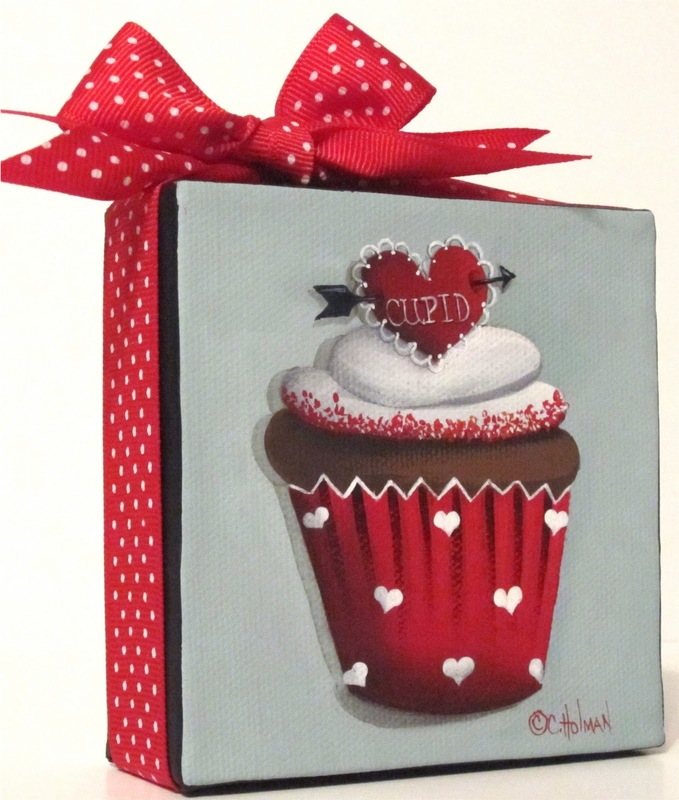 Love your Cupid cupcake painting. I can't wait to see what you create this year. Your paintings make me just feel so good when I look at them. Good to hear your father-in-law is trying hard to recover, sometimes they just give up, and that is not good. We'll be looking forward to your wonderful creations, I've set some goals for this year as well, but we must say, what we get done we get done. 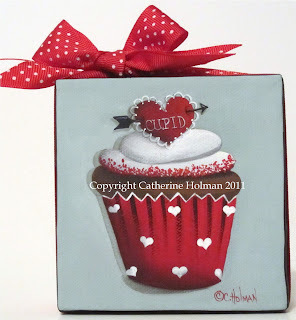 Cathie, I love your Cupid Cupcake!!! Wishing your Grandma Chickie a Big Happy Birthday! What a beautiful and sweet lady. Your Valentine Cupcake is adorable! I love it. Keeping your FIL in my prayers. Happy Birthday to Grandma Chickie 100 years young..Grandma Chickie looks wonderful..I'm sure she is an amazing lady. Your Cupid's Arrow Valentine Cupcake is adorable! I love all your cupcakes you create. Do get some rest, I know its hard when the family needs your help but you take care of you too O.k. Happy Birthday to your Grandma Chickie! She sounds like she is a hoot! I bet she has so many wonderful stories to share. I will keep your FIL in my prayers. Your chocolate cupcake is adorable! What a great picture! I love her graduation photo. Tell her happy 100th.